Master provides a variety of products to protect you and your office furniture. 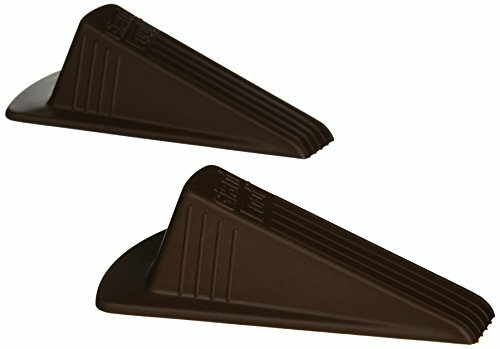 Master rubber doorstops are guaranteed to hold doors open securely to prevent tripping accidents and improve air circulation in confined areas. Designed for extra-large, heavy doors and doors with spring closures or high clearances up to 2 inches from the floor, the Master Giant Foot Doorstop is the ultimate doorstop. The large footprint grips tightly and stays in place when used on rough or uneven surfaces. It is constructed from impact-resistant rubber which stands up to daily use, and the Giant Foot will not mar floors or carpets. Made in the USA, the Master Giant Foot Doorstop is available in bright fluorescent colors to prevent tripping and promote safety in small spaces and doorways. The Master line of office organization and repair products provides "do-it-yourself" quick and easy solutions for everything and everyone! Designed for extra-large, heavy doors with high clearance and spring closures. Impact resistant Sanoprene TPR will not crush. A GIANT Size: 6-3/4"l x 3-1/2"w x 2"h.
If you have any questions about this product by Master Manufacturing, contact us by completing and submitting the form below. If you are looking for a specif part number, please include it with your message.